The theme of October’s Mixology Monday is exotic drinks, a category of beverages in which I am quite the raw novice. Exotic beverages always seem to require a lot of equally exotic ingredients that I don’t normally keep on hand: passion fruit, orgeat, rums older than Dakota Fanning–you get the idea. This class of drinks intimidates me, but it also intrigues me greatly, so I wanted to start moving in its direction. After all, these drinks are some of the best liquid fun you can experience, if they’re done right, so they’re worth the investment of time and capital. I’ve paid close attention this summer to Rick’s tiki experiments at Kaiser Penguin. 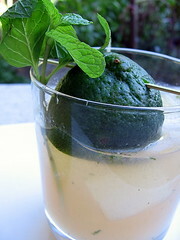 A few months ago, he posted a recipe for a Noa Noa cocktail, a mix of rum, lime, brown sugar, and mint. Sounded yummy to me, so the Noa Noa was my first choice. The recipe Rick posted (which I won’t actually reproduce here, since I used his recipe almost verbatim) called for demerara rum. I thought I had a convenient source for that, but I was wrong. In its place, I used another African rum, Starr, a product of the island of Mauritius. Starr’s flavor profile bears notes of citrus, cardamom, and a touch of vanilla, making it a lovely rum for sipping on its own. But it also mixes nicely, and my wife and I both loved the Noa Noa. Thanks, Rick! My second exotic was a slight variation on the El Floridita No. 1. So slight in fact that if were to alter its numbering in any way, I’d have to go with a cliché and call it El Floridita No. 1.1. 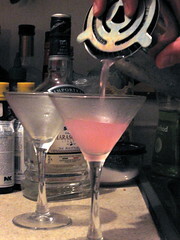 The pink tinge comes from the use of hibiscus syrup in place of simple syrup. My wife had made the hibiscus syrup for an unrelated food-writing commission, so since we had that on hand, I thought it would make a nice substitution. Technique: Shake over ice and strain into a cocktail glass. Feel free to post my recipe if you’d like – it wasn’t mine to begin with! It’s good to hear that other rums are being used in the Noa Noa; it’s so versatile. How did the hibiscus syrup taste in the drink? It looks pretty enough! i’m totally sold on this cocktail. it includes all the ingredients i love: hibiscus, rum, lime and cherry. in australia we can buy wild hibiscus flowers in syrup. they come in jars of whole little flowers which you drop into a champagne flute with a dash of the syrup and then you top it up with the sparkling wine. the petals in the flowers open up in the glass and they have a gorgeous flavour. best of all they’re totally edible so when you’ve guzzled the bubbly down you can munch on the flower. yum! i’ve also come across that same remarkable champagne product named the wild hibiscus flower in syrup. it is without a question of a doubt absolutely wonderful. it just goes so well with champagne, wether it’s moet, crystal or just some house brut you add it to. the website to check it out on is http://www.realindulgence.com – real indulgence! thats exactly what it is. hibiscus champagne really is as good as it gets. i mean i love champagne, but hibiscus champagne… it truly is realindulgence. you mentioned that your wife made a hibiscus syrup… can you share the recipe?